The official Skyrim update and the DLCs need to be cleaned individually before any other mod can be cleaned. 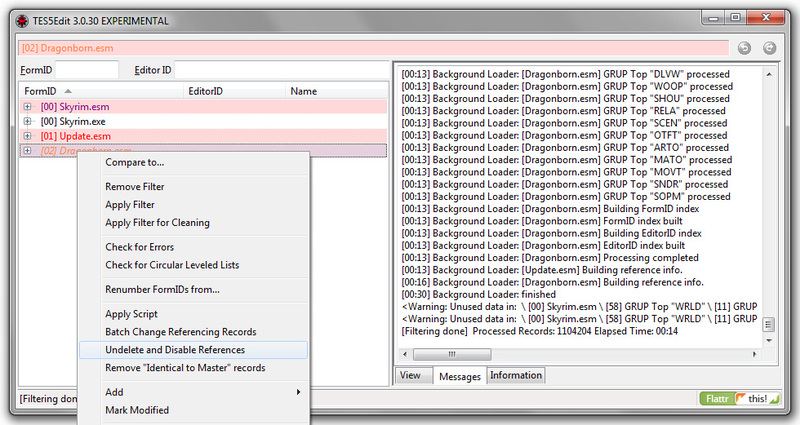 *Upon startup, TES5Edit will show a list of everything in the load-order, including Skyrim.esm (The base game-data). 2 - Check only "Skyrim.esm" and "Update.esm", and click "OK"
*TES5Edit will start loading the selected data, and check all references, which will take some time. When the message bar shows: "Background Loader: finished", the process is done. 3 - Now select all files, and right-click one of them. Select "Apply Filter for Cleaning" from the menu. *TES5Edit will start counting all records. This will take some time as well. When done, TES5Edit shows a complete tree of all references. 4 - Mark the "Update.esm", and DON'T MARK ANY OTHER FILES! Then right-click, and select "Undelete and Disable References". *When done processing, TES5Edit will show a message about how many records that were changed. Clean the Dragonborn DLC, using almost the same method as with the Update. 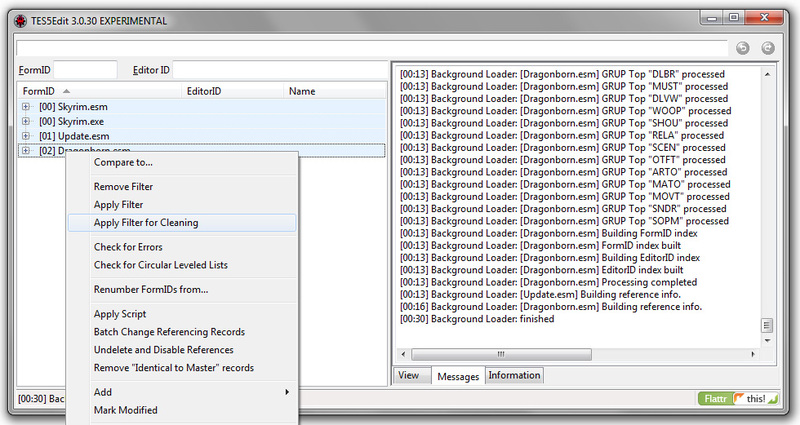 2 - Check "Skyrim.esm", "Update.esm" and "Dragonborn.esm", and click "OK"
3 - Select all files, and right-click one of them. Select "Apply Filter for Cleaning" from the menu. *TES5Edit will start counting all records again. 4 - Mark the "Dragonborn.esm", and DON'T MARK ANY OTHER FILES! Then right-click, and select "Undelete and Disable References". *When done processing, TES5Edit will show the message about how many records that were changed. Clean the HearthFires DLC, using the same method as with the Dragonborn DLC. 2 - Check "Skyrim.esm", "Update.esm" and "HearthFires.esm", and click "OK"
4 - Mark the "HearthFires.esm", and DON'T MARK ANY OTHER FILES! Then right-click, and select "Undelete and Disable References". Clean the Dawnguard DLC, using the same method as with the HearthFires & Dragonborn DLC. 2 - Check "Skyrim.esm", "Update.esm" and "Dawnguard.esm", and click "OK"
4 - Mark the "Dawnguard.esm", and DON'T MARK ANY OTHER FILES! Then right-click, and select "Undelete and Disable References". Skyrim is ready for launch! *If the game crashes don't worry. This happens sometimes at the very first launch because of inconsistency with game-cache. Just start Skyrim again and everything will work just fine.